This is an extremely collectible U.S. trilobite. It is a complete Dicranopeltis nereus from the Silurian of New York. This is one of the rarest and most sought-after trilobites from New York. We collected the quarry for a year, and only found one complete specimen. This classic Lichid trilobite is prone and exhibits very fine detail. The cephalon is covered in large pustules, which are easily seen on this specimen. 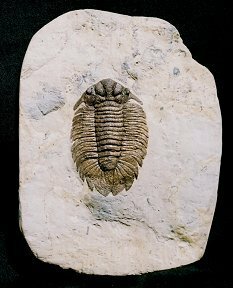 In fact, the entire carapace of the trilobite is covered with small pustules! The fossil has great natural color and contrast and is well showcased on the large matrix plate. Not only is this one of the very few examples of this highly collectible Lichid trilobite you will ever see, but it is a really, REALLY good one!